Como otros años vamos a celebrar la fiesta del Año Nuevo Persa, "Noruz" que según la tradición milenaria empieza con la entrada de la primavera y el renacimiento de la naturaleza. 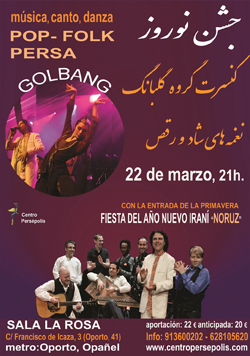 Con este motivo vamos a dar a conocer, por primera vez en nuestra programación, Música, Canto y Danza Pop-Folk Iraní por el prestigioso grupo de World Music, "Golbang" . Este grupo compuesto por 9 artistas iraníes y de otros países cuenta con la preciosa voz de Rostam , capaz de cantar en distintos idiomas y acentos de los pueblos iraníes, desde persa hasta baluchí y kurdo. De la misma manera la bailarina Agnes Gagge presenta danza iraní y de más regiones de la zona. En la fiesta no faltarán "Haft Sin" (Belén Persa para el año nuevo) ni dulces y está previsto que todos podamos participar y expresar nuestra alegría con danza o de otro modo, acompañando a los músicos. 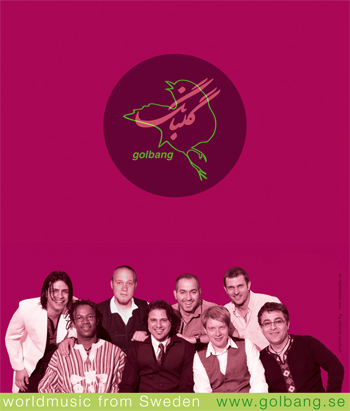 Golbang belongs to the small elite group of high-class bands that elevate the world music genre. When the distinct sounds of the various cultures shine through, as they do in Golbang’s music, it’s nothing less than magic. An important part of Golbang’s music is improvised, which very much contributes to their unique sound. Another equally important part is the variety of rhythms that can, and should, evolve into completely new forms, as the charasteristics depend on who is the interpreter at every given moment. Golbang is in many ways a reflexion of the eight virtuoso participants of the group, and every song can be performed in at least eight different ways. Golbang (The Song of the Nightingale in Persian) was founded 15 years ago by lead singer Rostam Mirlashari, originally from southeastern Iran. Over the years, the group’s musicians came together — often at The Royal College of Music in Stockholm where many of them studied–and experimented with combining Scandinavian and Middle Eastern folk melodies, as well as African rhythms. There, the unique sound of Golbang, now one of Scandinavia’s most popular world music bands, was created. 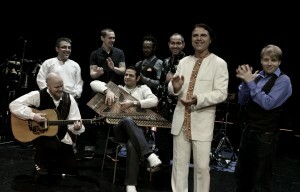 The band has performed at most major music venues in Scandinavia and abroad, and produced four CDs including the most recent, “Setareh”, or Star in Persian. اگر مایل هستید می توانید برای این آدرس ایمیل بزنید و همه برتامه ها را دریافت کنید.